A hairy woodpecker visits the buckeye tree next to the back deck. This morning in Huntington at 7:45AM it’s currently 44 degrees under mostly cloudy skies. Winds are out of the southwest at 0-5 mph. Relative humidity is 98%, dewpoint 44, barometric pressure 30.08″ and falling rapidly. We picked up 0.01″ of melted precipitation in the past 24hrs mostly from the melted “snizzle” that fell yesterday morning. Yesterday’s high was 45 and the overnight low was 32. A strengthening low pressure system currently out over the western Great Lakes will move eastward today as a warm front lifts northeastward into the region bring mild temperatures, rain and windy conditions. We’ll see cloudy skies with occasional rain showers, mainly this afternoon. Highs will be in the upper 50s with south winds around 10 mph and increasing to 15 to 20 mph this afternoon. Chance of rain is 80%. Tonight will be rainy with lows in the mid 50s and south winds 15 to 20 mph. Chance of rain is near 100%. Rain will continue into Friday. It will be windy with highs in the mid 60s and southwest winds 15 to 20 mph gusting up to 30 mph, and increasing to 20 to 30 mph with gusts up to 50 mph in the afternoon. Chance of rain is near 100%. Friday night should be mostly cloudy and breezy. Lows will be in the lower 40s with southwest winds 20 to 25 mph and gusting up to 45 mph. Saturday’s looking cloudy with a 50% chance of showers. Highs will be around 50 with southwest winds around 10 mph. Saturday night rain or snow showers are likely as cold air pulls in behind the departing low. Lows will be in the lower 30s. Chance of precipitation is 60%. Last year on this date we had a high of 55 and low of 44. We picked up 0.61″ of rain. Tomorrow will be 2m 43s shorter. The Moon is a waning crescent, 26d 11h old with 11% illumination. 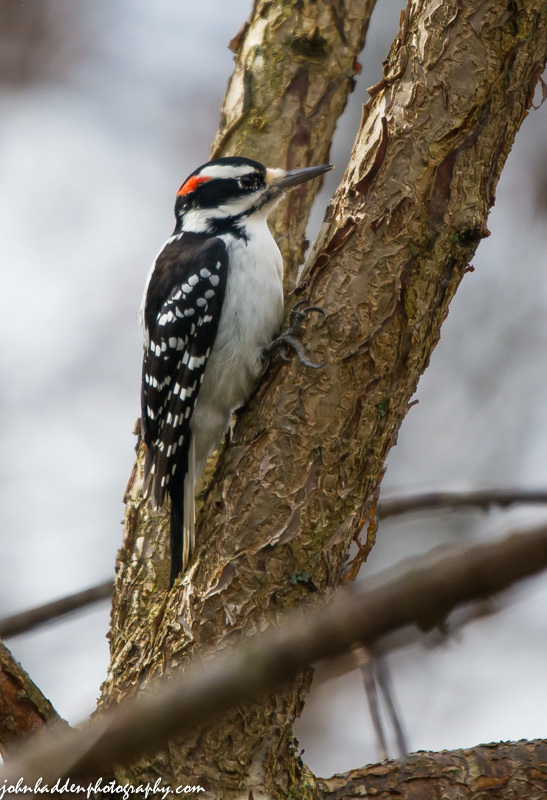 A pair of hairy woodpeckers were busily and noisily flying about the back yard the other day. I got this shot as one of them landed briefly in the buckeye tree by the back deck. Nikon D600, Sigma 120-400mm lens @ 400mm, ISO 1600, f/5.6, 1/2500″ exposure. 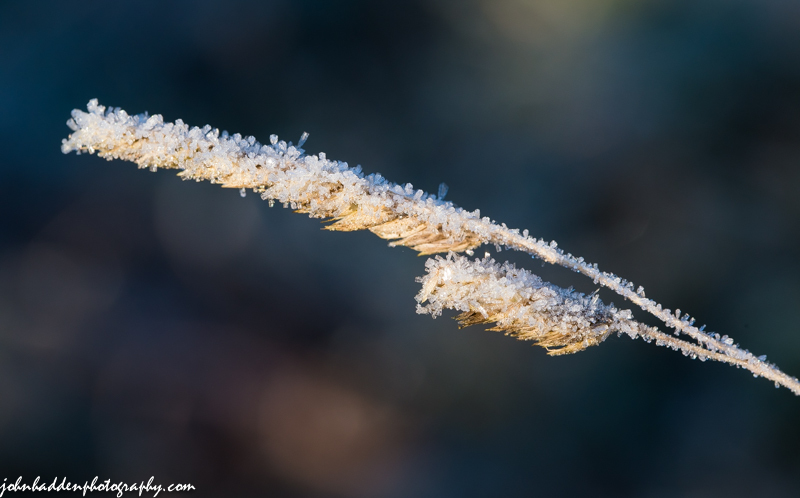 Yesterday’s heavy frost bejewels a dried grass head. This morning in Huntington at 6:30AM it’s currently 30 degrees under overcast skies. Winds are calm. Relative humidity is 92%, dewpoint 28,barometric pressure 30.28”. Yesterday’s high was 42, and the overnight low was 26. An upper level trough will bring a brief period of light snow across the northern Adirondacks east-southeastward into south-central Vermont early this morning. We’ll see cloudy a slight chance of light snow or flurries this morning in our area. Highs today will be in the mid 40s with light and variable winds. Chance of snow is 20%. A ridge of high pressure will build in this afternoon offering a few breaks in the clouds. Tonight should be partly cloudy with lows in the mid 30s and light and variable winds. A warm front will lift northeastward Thursday bringing cloudy skies, moderated temperatures and a good shot of rain mainly in the afternoon and into the evening. Highs will be in the mid 50s with south winds 10 to 15 mph. Chance of rain is 70%. Rain will continue into Thursday night with lows in the upper 50s and south winds 15 to 20 mph. Chance of rain is 90%. Rain will continue into Friday as a cold front follows on the heels of the warm air mass. It’ll be breezy and mild with highs in the lower 60s and south winds 20 to 25 mph gusting up to 40 mph. Chance of rain is 90%. Friday night should be partly cloudy with lows in the lower 40s. Last year on this date we had a high of 67 and a low of 54. We picked up 0.77″ of rain courtesy of the remnants of “Super Storm” Sandy. Burlington norms for this date are highs of 52°F and lows 35°F. The Moon is a waning crescent, 25d 10h old with 19% illumination. Yesterday’s first hard freeze of the season made for a sparkly morning. The grasses in our front field were decked out with glittering coats of frost that gleamed in the morning sunlight. Nikon D600, Sigma 105mm lens, ISO 640, f/13, 1/160″ exposure. 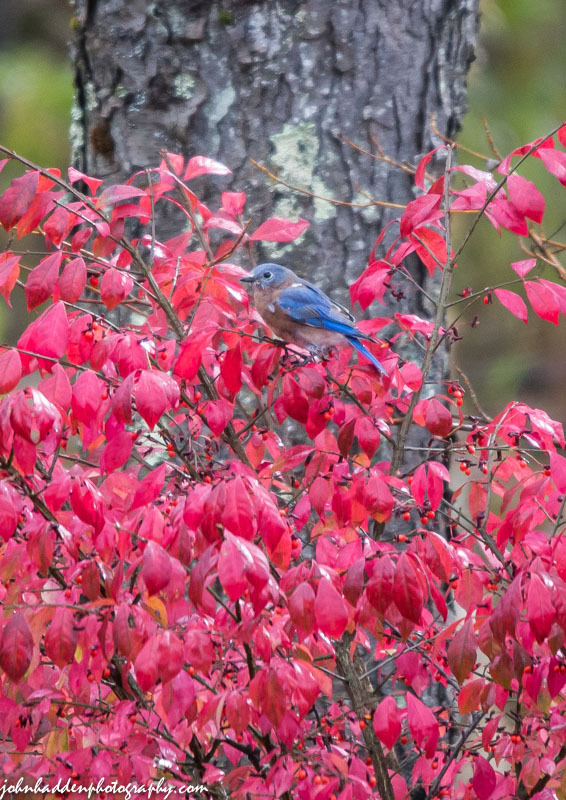 A bluebird feeds on burning bush berries. This morning in Huntington at 6:35AM it’s currently a brisk 19 degrees under clear skies. The crescent moon is shining brightly in the south. Winds are calm. Relative humidity is 94%, dewpoint 18, barometric pressure 30.45” and rising. We picked up 0.06” of rain in the past 24hrs. Yesterday’s high was 45, and the overnight low was 19. Chilly Canadian high pressure will crest over the region this morning having delivered the coldest air yet of the season. We’ll see sunny skies and cool temperature with highs only around 40 and light and variable winds. Tonight should be mostly clear until midnight, then become mostly cloudy with a slight chance of light snow after midnight as a weak mid-level disturbance moves in. Lows will be in the mid 20s with light and variable winds. Chance of snow is 20%. Wednesday should be cloudy with a chance of light snow in the morning. Accumulations of 0.5-1″ may occur especially south of our immediate area. Skies should become partly sunny in the afternoon as the trough departs. Highs will be in the lower 40s with light and variable winds. Chance of snow is 40%. Wednesday night should be partly cloudy with lows in the lower 30s and light and variable winds. A warm front will lift into the region Thursday bringing cloudy skies, moderated temperatures and a 50% chance of rain showers. Highs will be in the lower 50s with south winds 10 to 15 mph gusting up to 25 mph. Thursday night showers are likely. Lows will be in the upper 40s. Chance of rain is 70%. Last year on this date we had a high of 62 and a low of 45. The Moon is a waning crescent, 24d 10h old with 27% illumination. The bluebirds are on the move this time of year. 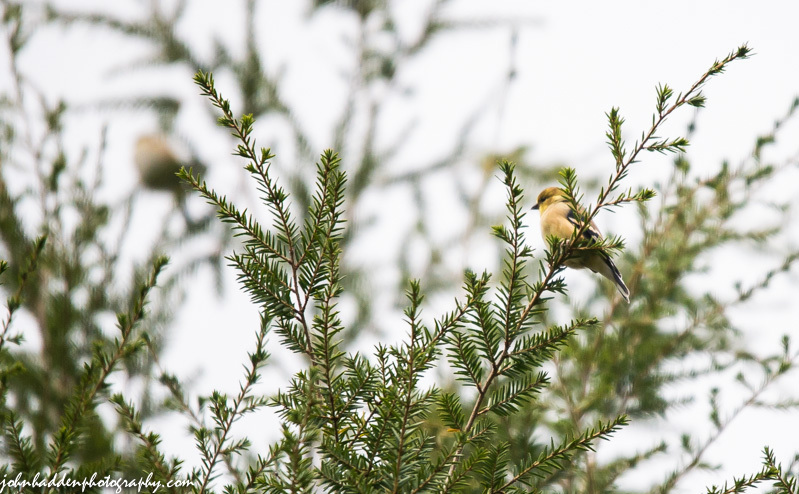 Other neighbors have reported seeing flocks of them over the past several days. A small group was camped out down by Fargo Brook feeding on the berries of the burning bush by the stream side. The contrast of colors was irresistible! Nikon D600, Sigma 120-400mm lens @ 400mm, ISO 1600, f/5.6, 1/800″ exposure. This morning in Huntington at 7:05AM it’s currently 39 degrees under overcast skies. Winds are out of the west at 0-3 mph. Relative humidity is 88%, dewpoint 36, barometric pressure 30.00″. We picked up 0.02″ of rain in the past 24hrs. Yesterday’s high was 45, and the overnight low was 29. A fast moving surface trough will cross just to our north today bringing scattered rain showers with some snow showers possible in the higher elevations. A large Canadian high pressure system will move into the area tonight and Tuesday bringing very chilly air. We’ll see mostly cloudy skies this morning with a chance of snow or rain showers this morning, then partly sunny skies later in the day. Highs will be in the lower 40s with southwest winds 15 to 20 mph, becoming northwesterly this afternoon. Chance of precipitation is 50%. Tonight should be clear and cold with lows around 19 and northwest winds around 10 mph until midnight, becoming light and variable. Tuesday should be partly sunny in the morning, then clearing. Highs will only be around 40 with light and variable winds. Tuesday night should be mostly cloudy with lows in the mid 20s and light and variable winds. Wednesday’s looking partly sunny with highs in the lower 40s and light and variable winds. Wednesday night should be mostly clear with lows around 30. Moon is a waning crescent, 23d 10h old with 36% illumination. 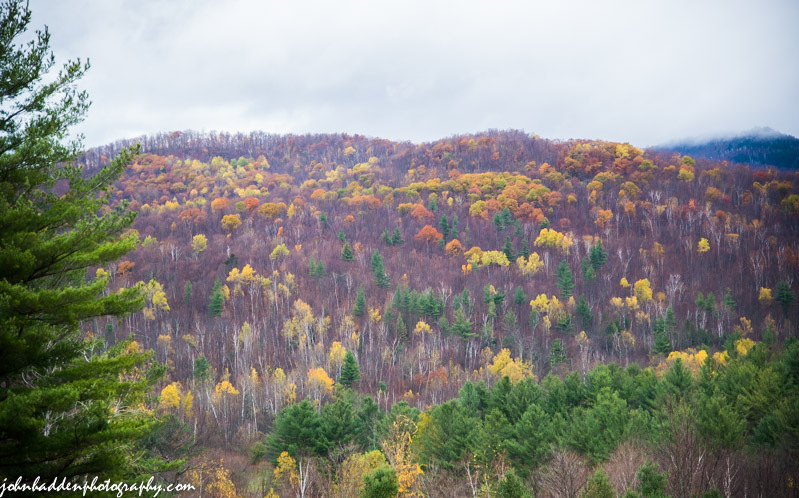 The poplars, aspens, and oaks hold on to their leaves—their last splashes of foliage color on the hillside above upper East Street looking like a sponge painting yesterday morning. Nikon D600, Nikon 24-120mm lens @ 86mm, circular polarizer, ISO 250, f/4, 1/125″ exposure. This morning in Huntington at 8:40AM it’s currently 42 degrees under mostly cloudy skies. Winds are out of the west at 0-4 mph. Relative humidity is 80%, dewpoint 36, barometric pressure 29.79″. Yesterday’s high was 45, and the overnight low was 41. The string of below normal temperatures continues. Weak high pressure will build today. We’ll see mostly cloudy skies with a chance of rain showers, mainly this morning. Highs will be in the lower 40s with southwest winds around 10 mph, becoming westerly this afternoon. Chance of rain is 40%. Tonight should be partly cloudy with a slight chance of snow showers after midnight. Lows will be around 30 with west winds around 10 mph, becoming southerly after midnight. Chance of snow is 20%. Monday should start out mostly cloudy in the morning, then becoming partly sunny. There’s a chance of snow or rain showers, mainly in the morning. Highs will be in the lower 40s with southwest winds 15 to 20 mph, becoming northwesterly in the afternoon. Chance of precipitation is 40%. High pressure will build in Monday night bringing mostly clear skies and quite chilly temperatures with lows in the upper teens to lower 20s and northwest winds 10 to 15 mph. Tuesday’s looking sunny and cold with highs only in the upper 30s and northwest winds 10 to 15 mph. Tuesday night should be partly cloudy with lows in the upper 20s. Last year on this date we had a high of 69 and low of 44. Moon is a waning crescent, 22d 12h old with 45% illumination. The prolific cone crop in the studio hemlock continues to attract many birds. These Pine Siskins were perched at the top. Nikon D600, Sigma 120-400mm lens @ 400mm, ISO 2000, f/5.6, 1/1600″ exposure. Camel’s Hump dusted with snow yesterday afternoon. This morning in Huntington at 8:30AM it’s currently a raw 39 degrees and raining lightly under overcast skies. Winds are calm. Relative humidity is 89%, dewpoint 36, barometric pressure 30.01″ and falling. We’ve picked up just a trace of rain overnight. Yesterday’s high was 44, and the overnight low was 28.
low pressure will track from the northern Great Lakes eastward across southern Quebec today and tonight. We’ll see cloudy skies with a slight chance of rain or snow showers this morning. Highs will be in the mid 40s with south winds 10 to 15 mph gusting up to 35 mph this afternoon. Chance of precipitation is 20%. Tonight should be cloudy with a slight chance of rain showers and a slight chance of snow showers after midnight. Lows will be in the lower 30s with southwest winds 15 to 20 mph gusting up to 30 mph. Chance of precipitation is 20%. Sunday should be mostly cloudy with a slight chance of rain or snow showers in the morning, then partly sunny in the afternoon as a ridge of high pressure builds in to the region. Highs will be in the lower 40s with west winds 10 to 15 mph. Chance of precipitation is 20%. Sunday night should be partly cloudy with lows around 30 and west winds around 10 mph. Monday’s looking partly sunny with a 40% chance of rain showers as another cold front and associated low pressure system slide southeastward. Highs will be in the mid 40s with southwest winds 10 to 15 mph. Monday night should be partly cloudy with a 30% chance of rain showers and lows in the upper 20s. Last year on this date we had a high of 64 and a low of 42. The Moon is in its last quarter, 21d 12h old with 54% illumination. It’s coming! 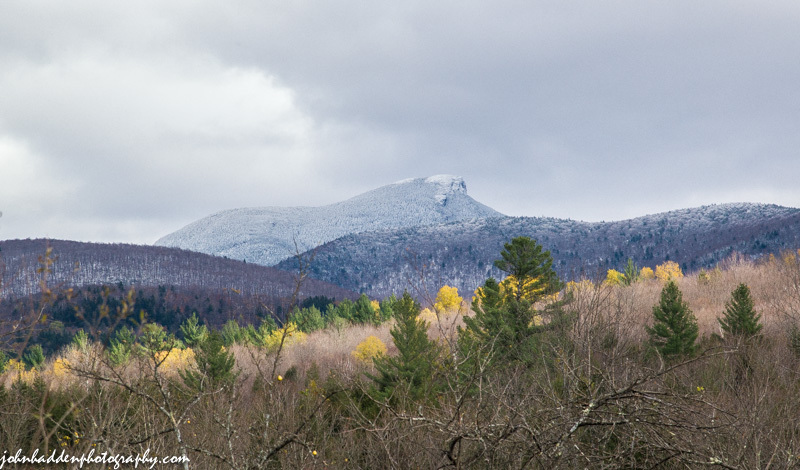 Camel’s Hump sat dusted with snow yesterday as the last yellow poplar leaves caught some fleeting afternoon sunshine. Nikon D600, Nikon 24-120mm lens @ 120mm, circular polarizer, ISO 800, f/9, 1/200″ exposure. This morning in Huntington at 6:40AM it’s currently 35 degrees under overcast skies. A few snowflakes are falling. Winds are out of the SW at 3-4 mph, Relative humidity is 89%, dewpoint 32, barometric pressure 29.98” and rising. We picked up 0.8” of rain in the past 24hrs and a thin layer of graupelly sleet. Yesterday’s high was 43, and the overnight low was 35.
cloudy. We’ll see mostly cloudy skies with a slight chance of snow showers this morning. Highs will only be in the lower 40s with northwest winds 10 to 15 mph. Chance of snow is 20%. Tonight should be partly cloudy with lows in the upper 20s and west winds around 10 mph, becoming southerly after midnight. Saturday will bring a slight chance of snow showers in the morning along with cloudy skies and a chance of rain showers later in the day as a clipper system moves into the region from the northwest. Highs will be in the lower 40s with south winds 15 to 20 mph and gusting up to 30 mph. Chance of precipitation is 20%. Saturday night should be mostly cloudy with a chance of snow showers. Lows will be in the lower 30s with south winds 15 to 20 mph and gusting up to 30 mph. Chance of snow is 30%. High pressure will ridge in Sunday bringing partly sunny skies with a chance of rain or snow showers in the morning as the clipper departs. Highs will be in the mid 40s with west winds 10 to 15 mph. Chance of precipitation is 30%. Sunday night should be partly cloudy with lows around 30. Last year on this date we had a high of 65 and a low of 35. The Moon is waning gibbous, 20d 10h old with 64% illumination. 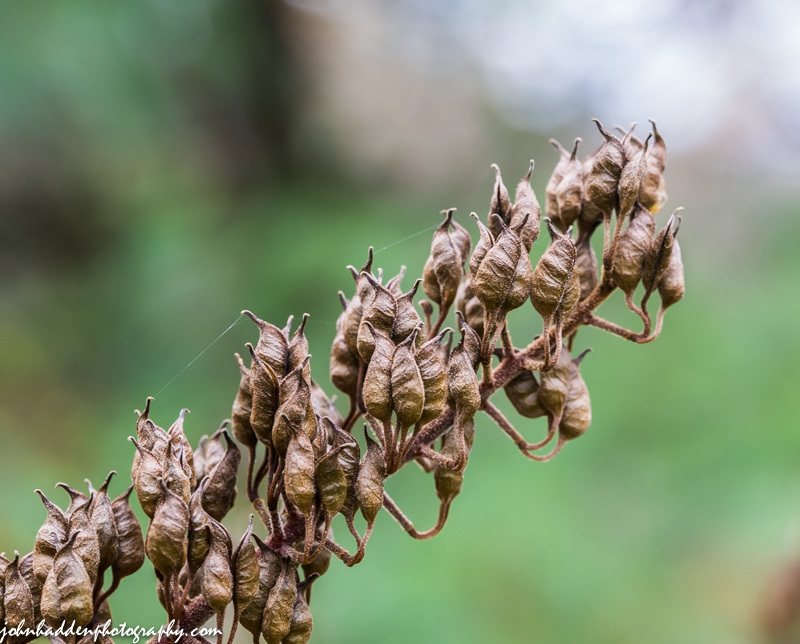 One of the last blooming flowers of the fall, bug bane, has set its seed pods. I like the delicacy of the pod shapes. Nikon D600, Sigma 105mm lens, ISO 1250, f/13, 1/30″ exposure.